Made by Do, Joungmee in Sydney, New South Wales, Australia, 2001. Joung-Mee Do was born in Korea in 1966, studied in Korea in the 1990s and graduated Master of Arts (Fine Art) at Royal Melbourne Institute ofTechnology University, Melbourne, Australia in 1999 (See c/v in file). 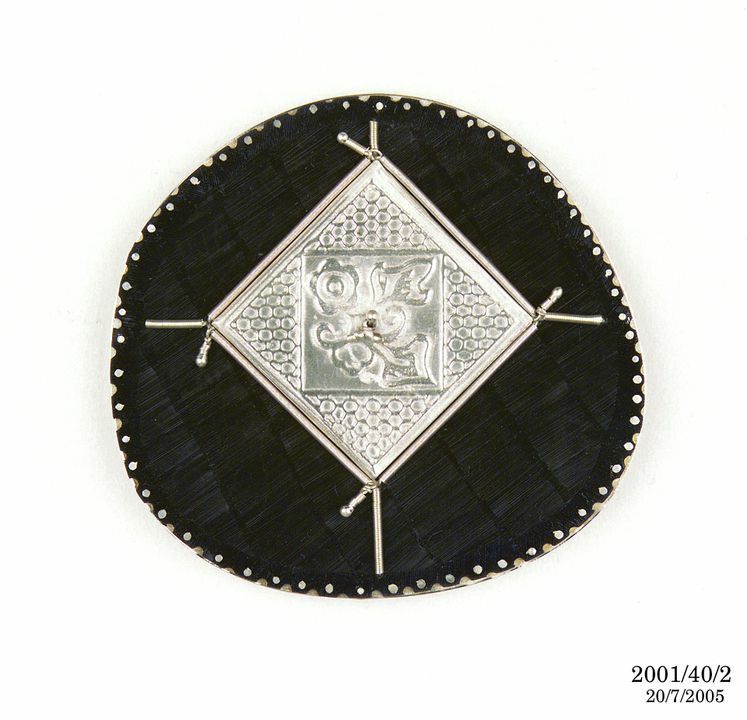 Joung-Mee Do uses the traditional Korean jewellery making technique, Iybsa (inlay). She also incorporates traditional Korean textile patterns into metalwork using etching, and metal colouring techniques. Brooch, oxidised steel, engraved and impressed silver, made by Joungmee Do, Sydney, New South Wales, Australia, 2001. Round black brooch, chiselled and oxidised decoration, with a silver square centrepiece which has a Korean traditional textile design stamped onto it, and small handcoiled metal thread springs at each point. Small silver dots are inlaid along the edge of the brooch. Reverse stamped with motif of textile design, with two pins, and two very small metal discs. Joung-Mee Do (b.1966) is an establised Korean metal artist proficient in the traditional Korean metal-working techniques of Iybsa (metal inlay) which she spent some years perfecting under the tutelage of the Korean master Kyo Joon Choi. She has been interested in incorporating into metal the qualities of textiles by using inlay and chiselling techniques as well as exploring them in combination with other techniques such as etching. 'Through this exhibition I would like to begin to gain an understanding of myown identity as an individual in relationship to others. The play of genderrelationships is repeated in the use of the shapes - the square and circle -traditionally in Korea associated with both earth and heaven, male and female.It is like Eum (Yin) and Yang philosophy. The rectangular shape represents a woman or wife and the round shape represents man or husband. At the same time the black colour symbolises woman, and the silver colour symbolises man. For the main body of the brooch, the metal (steel) is chiselled all over, then chiselled again several times in different directions, and oxidised. The silver wire is hammered around the edges across the chiselled grooves. (This is the Choum Iybsa technique of inlaying metal.) For the square in the middle, and for the reverse, Joung-Mee Do has made a stamp with an etching design, and then used the stamp to impress a motif of a traditional textile pattern into the sheet of silver. Around the edge of this, she has fixed a finely coiled silver wire, or spring. For the textile pattern, she made an engraved metal stamp by photocopying the design onto metal sheet, then etching it with ferric sulphide. The stamp was them impressed into the silver plate in the centre of the brooch (and reverse). Owned by the artist and exhibited at Object Galleries in Sydney from 3 February to 18 March 2001.